Plant a tree in memory of Patricia "Pat"
Patricia “Pat” Elliott, 87, of Benton, Kentucky, formerly of Bremen, passed away Friday, September 14, 2018 at the Ray and Kay Eckstein Hospice Care Center of Paducah, Kentucky. She was born in Port Arthur, Texas, October 14, 1930, daughter of the late Turner Alonzo Baker and Elyea Smith Baker. 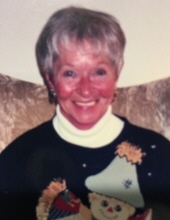 Pat was a retired RN and a member of St. Peters of the Lakes Episcopal Church in Gilbertsville and the Pilot’s Club. In addition to her parents, she was preceded in death her husband, Milton "Chuck" Crawford and a brother, Turner Baker. Pat is survived by two children, Lynn Hurst of Benton and David Hurst of Golden, Colorado; four grandchildren, Leslie Vowles of Ruston, Louisiana, Patrick Ray of Lafayette, Louisiana, Jeremiah Hurst of Florida and Gabrielle Serrano of Florida; one brother, Riley Baker of Columbia, South Carolina; two great grandchildren and numerous nieces and nephews. She was preceded in death by her husband, Milton “Chuck” Crawford; parents, Turner Alonzo and Elyea Devou Smith Baker; and one brother, Turner Baker. Services will be Saturday, October 6 at 2:00 PM from the chapel of Hightower Funeral Home with speakers Nancy Smith, Jeremiah Hurst, Leslie Vowles and Riley Baker officiating. Inurnment will be held in Bremen City Cemetery. To plant a tree in memory of Patricia "Pat" Baker Elliott, please visit our Tribute Store. "Email Address" would like to share the life celebration of Patricia "Pat" Baker Elliott. Click on the "link" to go to share a favorite memory or leave a condolence message for the family.